Increased understanding of latitudinal gradients and patterns of biodiversity at a regional scale is important for many reasons (e.g. biodiversity conservation, species management, climate change). This study assessed rock pool fish assemblages and their relationship to latitude at 39 locations along 860 km of the New South Wales (NSW) coast, eastern Australia, from Sandon to Merimbula (29.67816°S to 36.90046°S). Thirty-minute deployments of miniature baited remote underwater video (mini-BRUV) were used to survey five or more replicates (rock pools) at each location for species richness and maximum number (MaxN) of individual fishes. A total of 371 rock pools were sampled, with 7070 fish recorded from 46 families and 115 species. Fish species richness was greatest in northern NSW, with a significant decline in species richness with increasing latitude, at a rate of 1.7 species per degree of latitude south. Tropical species were dominant in northern NSW (Coffs Harbour ∼30°S), whilst temperate species diversity was greatest towards central NSW (Port Stephens 32.7°S). Differences amongst rock pool assemblages were primarily driven by eight species from eight different families. 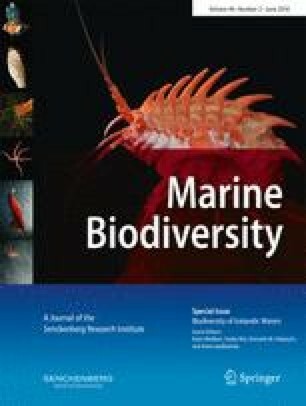 This study documents latitudinal fish assemblage patterns along the east Australian coast and provides a baseline for elucidating future changes. The online version of this article (doi: 10.1007/s12526-016-0560-8) contains supplementary material, which is available to authorized users. This project was made possible with funding assistance from the Hunter-Central Rivers Local Land Services. Assistance with data collection was provided by Patrick Tegart, Ellie Marks, Jack McNamara and Brian Hughes. Thanks to Dr Kate Lee and Dr Ashley Fowler from NSW DPI, and to two anonymous reviewers for comments that helped improve the manuscript.